The Cavaliers hosted the New York Knicks Wednesday night and thanks to some lockdown defense in the fourth quarter, came away with a 91-84 victory. It was a hard-fought contest, as the Knicks made the Cavs play a slower-tempo than Head Coach David Blatt would have liked. It was the first time the entire roster has been healthy this season, as Mo Williams returned from a thumb injury that sidelined him for two games. With the win, Cleveland extended its win-streak to six games and improved to 13-1 on the season at home. The Knicks came into play on a bit of a hot-streak, as they had won four games in a row before losing at home Tuesday night against Orlando. 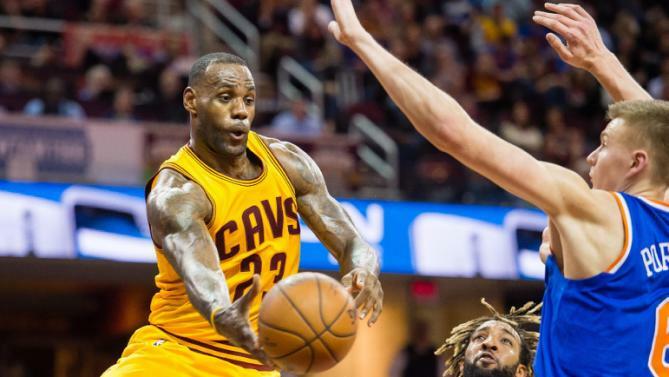 The Cavs got out to a nice start, as Kevin Love put up eight points in the first quarter, while LeBron James and Iman Shumpert each added six, helping the Cavs lead 31-24 at the end of one. The Knicks were without Carmelo Anthony, so rookie-sensation, Kristaps Porzingis picked up some of the slack, scoring eight in the first quarter. New York hung with the Cavs in the second quarter, which was slow moving, as both teams committed five fouls in the first five minutes of the quarter, but the Cavs remained in front, entering halftime with a 55-50 lead. There were four technical fouls in the quarter, as neither team was feeling in the Christmas spirit on the court. All in all, there were 16 fouls committed in the second quarter, nine of which were against Cleveland. LeBron and Love each scored 15 points in the half, but Porzingis kept it close with 16 points in the half, including a buzzer-beater for three to end the second quarter. The 7’3 rookie continued his great game scoring seven more points in the third quarter to bring his team back to within one and the Knicks would tie the game at 68, thanks to a three-pointer from Jose Calderon with three and a half minutes to go in the third quarter. Matthew Dellavedova and Tristan Thompson put the Cavs back up by four with under two minutes to play in the third, but the Knicks would answer back, as Aaron Afflalo made a nice spin move and knocked down a close-range jumper to tie the game at 72. The Cavs were outscored 22-17 in the third quarter, as the slow-paced tempo seemed to work to the Knicks’ advantage all night, keeping Cleveland from getting out to fast breaks and running up and down the court. LeBron was held scoreless in the third quarter. Lou Amundson gave the Knicks their first lead of the night to start the fourth quarter. It would be short-lived, as Kyrie Irving hit a free-throw following a defensive three-second violation, and Thompson knocked down a pair of free throws to put the Cavs back on top 75-74 with 9:34 to play. Afflalo kept the Knicks close with a couple of clutch jumpers and then gave New York an 80-79 lead with five and a half minutes to play on a drive to the basket. Both teams would go back and forth, as Love tied the game with a free throw, Langston Galloway gave the Knicks back the lead, and Thompson tied it up at 82 with 3:30 to go. The Cavs would benefit from a Lance Thomas turnover, as Dellavedova found LeBron on the fast break for a layup to make it 84-82 with 3:10 left. Cleveland’s defense clamped down to close out the game, allowing just two points in the final four minutes. LeBron threw down a thunderous slam to seal the game with 50 seconds to play, putting the Cavs ahead by six. The Knicks would try to rally back, but could not catch up and the Cavs finished it off, thanks to Thompson hitting two free throws to make it 90-84 with 10 seconds to play. Cleveland outscored New York 19-12 in the fourth quarter, en route to the 91-84 victory. A big part of that lockdown defense was holding Porzingis scoreless in the quarter. The Cavs travel to Oakland for the highly-anticipated Finals rematch versus the Golden State Warriors on Christmas Day. LeBron moved up a notch in the NBA’s all-time assist leaders with his first of the night early in the first quarter, as James passed John Lucas, to move into 23rd all-time. It was Lebron’s 6,455th assist. He’ll be 31 in a week. He finished the night with five assists and needs 13 more to pass Stephon Marbury and move into 22nd. He is also 18th on the all-time scoring list, in case you were wondering, and contributed 24 points with nine rebounds in the win. It was Love’s 12th double-double of the season, as he put up 23 points and 13 rebounds. He had not put up double-digit points and rebounds in the same game since December 4th, but has been steady all season, coming into the night averaging 17 points and 10.5 rebounds per game, ninth in the league in boards. The 20-year-old from Latvia, Porzingis, made the most of being the only star on the floor for the Knicks with Melo sidelined, as the rookie scored 23 points. He was perfect on his first four attempts from downtown, and slammed home a couple put-back dunks, as well. Knicks’ reserve forward, Derrick Williams had one of his best games of the season, putting up 11 points off the bench. He was a perfect seven-of-seven at the free-throw line. It’s been a long road for Williams, since being drafted second overall in the 2011 draft, one pick behind Kyrie Irving. The months leading up to that draft, there was some debate on whether or not the Cavs should select Irving or the forward, who was excellent in two years at the University of Arizona, but four years later, Williams is playing for his third different team, after unsuccessful tenures with the Timberwolves and Kings. Maybe he has found a new home in New York, but it looks like the Cavs made the right choice. Irving had a rough night in just his second game back from a knee injury, as the point guard went one-for-seven from the field, finishing with five points and four assists in 19 minutes.